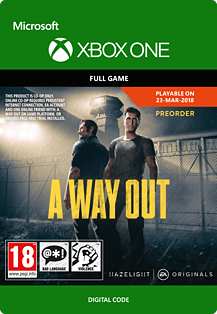 A Way Out is a couch or online co-op only game where you play the role of one of two prisoners in a daring escape from a maximum-security penitentiary. What begins as a thrilling escape quickly turns into an emotional adventure unlike anything seen & played before. Use the Friends Pass Online when you purchase the full game. Get ready for an action-packed co-op experience unlike anything you’ve ever played with A Way Out, from the creator of Brothers – A Tale of Two Sons. A Way Out is designed to be played with two players from start to finish. You can team up with a friend on your couch and play, or you can invite any of your friends online regardless of whether or not they’ve purchased the game. That’s right, when you buy the full game you can play the entire experience with any of your friends online. Send them an invite, they’ll unlock the Free Trial, and then you’re ready to play.